We are getting extremely close to the saturation stage in Cydia, where developers are having a difficult time creating new and unique tweaks which haven’t already been thought of. With that being the case, jailbreak devs tend to be really creative and inventive or attempt to improve upon an existing solution by coming up with a better implementation of something that already exists. The latter of the two options is obviously the easiest and requires the least amount of brain power. Whilst Cydia contains some brilliant, and useful enhancements, there is no getting away from the fact that a lot of the tweaks that are hosted through various repositories are quickly coded and buggy pieces of work which run the risk of causing device boot loops or conflicting with other software. Whilst this isn’t a particularly useful situation for the end user, it does mean that a number of possibilities still exist for resourceful coders. But what about the flip side? What about programmers who want to create something entirely new which hasn’t been done before? It looks as though iOS developer Alberto De Luca has put his brain into gear and done just that by creating and releasing the Messages2PDF tweak. One thing I love about the Cydia ecosphere is the naming conventions that developers use, which make it generally pretty easy to guess what the tweak’s main purpose is. In this instance, Messages2PDF is a tweak which creates a PDF document out of all the text messages saved on the user’s device. Once the messages list has been exported to PDF, it can then be easily attached to an email which uses the in-built Mail application and can be forwarded to any address as an attachment. Messages2PDF is officially classed as a utility, and requires the user to set up their international prefix through the Settings panel before the export process can begin. The tweak is fully compatible with iOS 5 meaning that it can also store and export iMessage conversations as well as texts, and has full backwards compatibility with devices running iOS 4.X. Messages2PDF will definitely come under the no frills, does what it says on the tin title as it features a very simple user interface which allows the PDF file to be created with one button, then attached to an email in an efficient manner. As far as I am aware, De Luca has created an iDevice enhancement which exists in its own class, with nothing else of similar functionality being available. 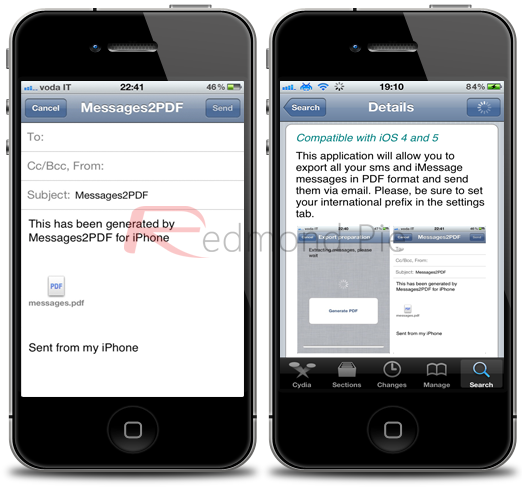 Messages2PDF is available via the BigBoss repository as a commercial package at a cost of $1.49.